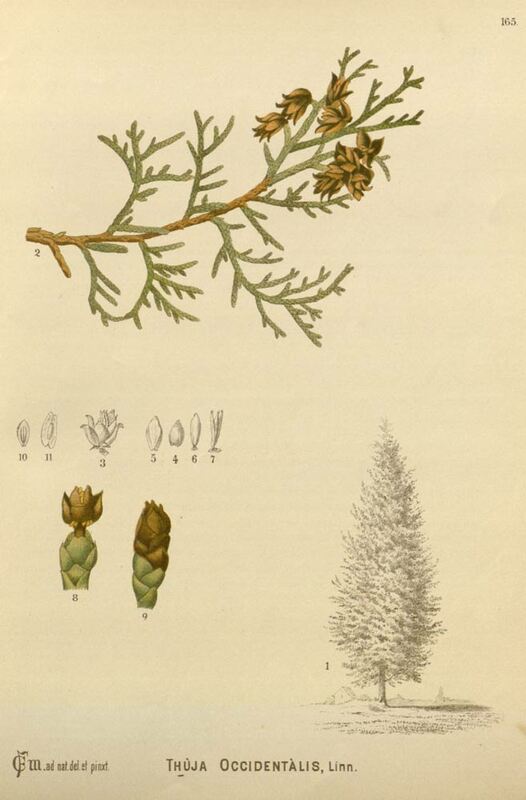 Thuja, sometimes called tree of life, is a species of evergreen, coniferous tree in the cypress family that is native to eastern North America. Although it is sometimes erroneously called yellow cedar and northern or eastern white cedar, the tree is not of that genus. The foliage of the tree is processed for its oil content, which contains a compound called thujone that is used in the cosmetic industry as a fragrance. 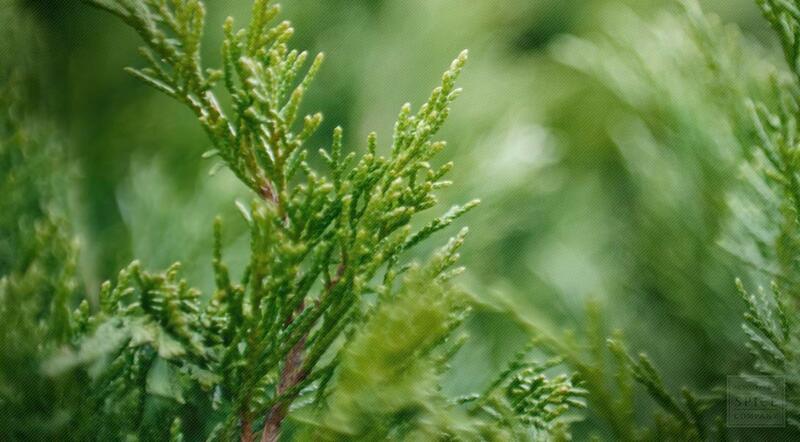 Thuja is also tinctured or infused to make other products for topical application. Thuja occidentalis is an evergreen coniferous tree, in the cypress family Cupressaceae. Thuja is a small tree, growing only to a height of 30-65 feet (roughly 10–20 meters). The trunk diameter averages 1 1/3 feet (0.4 meters), though on occasion it can reach heights of nearly 100 feet (roughly 30 meters) tall and be 5 feet (1.6 meters) in diameter. More usually, tree is often stunted or prostrate. The thuja tree's bark is red-brown and furrowed. It peels in narrow, longitudinal strips. Its foliage forms in flat sprays (fan-like branches) and with small scale-like leaves. Its cones are slender and yellow-green with 6-8 overlapping scales; they ripen brown. Arborvitae is Latin for "tree of life". It should be noted that despite the various “cedar” related common names, this plant is not related to true cedar. Thuja occidentalis is native to the northeast of the United States and the southeast of Canada, but widely cultivated as an ornamental plant. Thuja occidentalis grows in wet forests. It is particularly abundant in coniferous swamps. It can also be found growing on cliffs and rocky stream banks in full to part sun. Thuja plants are usually found on neutral to alkaline limestone soils. Sow seed when ripe in the autumn in a cold frame. When they are large enough to handle, transplant the seedlings out into individual pots and grow them on in the greenhouse for their first winter. Plant them out into their permanent locations in late spring or early summer, after the last expected frosts. Thuja leaves and young twigs can be harvested as required and used fresh or dried. Store dried thuja in an airtight container in a cool, dry place. Thuja is a tree that grows in the United States. While its name makes it sound much more exotic, the tree is native to this North American region. It has a mystical past quite different from its modern use. Native Americans once burned thuja twigs in order to scare away evil spirits. Now the uses for thuja are a little less mystical and a little more practical. Still, this is a special plant and maybe it does scare away disease. Thuja twigs are very capable as an expectorant. That means that the plant actually works to thin the mucus in the respiratory tract and all throughout the body. It can help to loosen phlegm and make coughs more productive when you’re suffering from a respiratory infection. Using the thuja twigs will also come in hand if you’re having trouble eliminating water from your body. If you’re suffering from bloating and excess water weight, thuja can help to eliminate it. For this reason, it can also be used to aid in the treatment of kidney infections such as cystitis. If you’re suffering from fungal infections such as ringworm, thrush, or athlete’s foot, you may find that thuja twigs can help to fight the infection and give you relief. You can also use thuja twigs to fight viral infections on the skin that cause warts. You can be free from embarrassing warts and unsightly fungal infections when you use this herb. For muscle pain and tightness, you can’t beat thuja twigs for providing relief. You’ll be able to relax the muscles and give your body the rest it needs. For women’s health, thuja provides a special relief. It can actually bring on menses and cause your period to start. This is great news if you have irregular periods and you don’t want to take pharmaceuticals to correct the problem. However, you shouldn’t take thuja if you’re pregnant. Make certain you’re not pregnant before beginning treatment with this herb. thuja twigs can be used in the form of a tincture or a decoction that’s taken daily. You’ll need to follow the recommended dose from the manufacturer or supplier. Thuja twigs may not be used to rid the body of evil spirits, but it can rid the body of toxins and infection. Try adding thuja twigs to your medicine cabinet so that you can be prepared for respiratory infections, excess water weight, and even hormonal problems with the menstrual cycle.